Preheat oven to 350°F. Spray 13x9-inch baking pan with nonstick cooking spray. 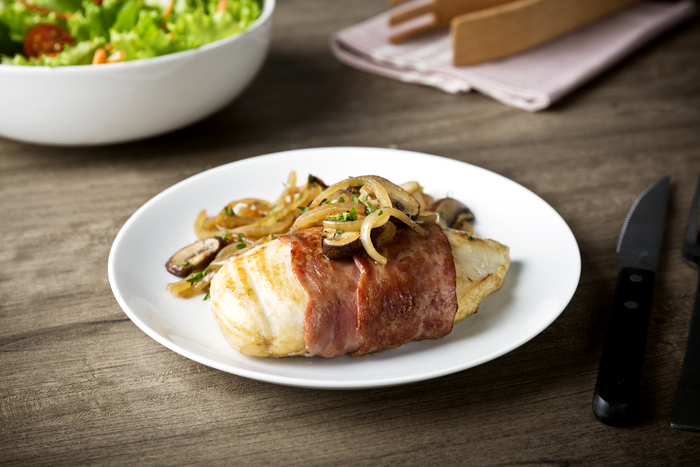 Wrap 2 bacon slices around each chicken breast. Season lightly with salt and pepper. Heat 1 tablespoon oil in large nonstick skillet over medium-high heat. Add chicken; cook 2 to 3 minutes per side until chicken and bacon are browned. Transfer to prepared baking pan. Bake about 45 minutes or until chicken is cooked through (165°F). Heat remaining 1 tablespoon oil in same skillet over medium-high heat. Add mushrooms and onion; cook and stir about 5 minutes or until tender. Add sherry; cook and stir until absorbed. Add broth; cook and stir until reduced slightly. Stir in ½ teaspoon salt and ¼ teaspoon pepper. Place chicken on serving plates; serve with mushroom mixture.